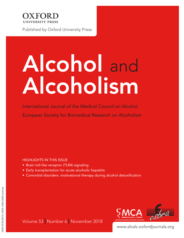 Alcohol and Alcoholism publishes papers on the biomedical, psychological, and sociological aspects of alcoholism and alcohol research, provided that they make a new and significant contribution to knowledge in the field. Alcohol is linked to over 200 medical conditions, causes a number of cancers and a raft of social issues that collectively place a major burden on society. Children are particularly susceptible to the harms from alcohol consumption due to their developing brains and inexperience regarding consumption risks. For example, early onset drinking is linked with various adverse psychological, physical, and social outcomes, such as alcohol dependence, neurological dysfunction, and risky/unwanted sexual interactions. Despite the harm alcohol can cause, there are currently little to no legislative regulations in place on alcohol marketing in many countries. Marketing is a crucial aspect driving demand for alcohol, which is concerning given the billions of dollars spent by the alcohol industry on marketing every year. For example, Diageo, the largest global alcohol company, spent £1.8 billion on its global marketing strategy in the 2016/2017 financial year (50% of its operating profit). Alcohol marketing contributes to the worldwide burden of alcohol-related harm by promoting the misleading aspects of alcohol, normalising it as an ordinary commodity, and increasing overall consumption. Children are particularly susceptible to the misleading aspects of alcohol marketing and their exposure has been associated with increased consumption and hazardous drinking patterns. Children are particularly susceptible to the harms from alcohol consumption due to their developing brains and inexperience regarding consumption risks. The WHO recommends restrictions on alcohol marketing as one of the most cost-effective policy interventions for reducing alcohol-related harm. However, many jurisdictions still rely on self-regulatory models for alcohol marketing, in which the industry is responsible for creating, monitoring, and enforcing their own marketing codes. These self-regulatory systems have consistently failed at protecting children from exposure to alcohol marketing, leaving children vulnerable to the adverse effects of exposure. Until recently, estimates of children’s exposure to alcohol marketing have relied on self-reporting measures that may not accurately quantify the extent of children’s exposure to alcohol marketing and thus the limitations of self-regulation. Using automated wearable cameras, we found that New Zealand children are exposed to alcohol marketing on average 4.5 times per day. Children were exposed to alcohol marketing in places such as the home, licensed outlets, and sports venues via a variety of promotions such as sports sponsorship, merchandise, and shopfront signage. Furthermore, Māori (the indigious people of New Zealand) and Pacific children had five and three times higher rates of exposure to alcohol marketing than Non-Māori/Pacific children, respectively. Disparities were mainly attributed to higher rates of exposure via off-licence outlets and sports sponosorship for Māori children. This exposure occurred at a time when the New Zealand Government did nothing, despite being advised to increase restrictions on alcohol marketing by the Law Commission in 2010 and by the Ministerial Forum on Alcohol Marketing and Sponsorship in 2014. The higher rates of exposure to alcohol marketing for Māori children demonstrate the government is not meeting its obligations to Māori under the Treaty of Waitangi, particularly as Māori are 1.5 times more likely to be hazardous drinkers than non-Māori. This research provides further evidence of the need for legislative restrictions on alcohol marketing, specifically, ending industry self-regulation of alcohol marketing, banning alcohol sponsorship of sport, and increasing restrictions on alcohol outlet shopfronts. Introducing alcohol marketing restrictions…would substantially…protect children from the adverse effects of early onset alcohol consumption. Introducing alcohol marketing restrictions similar to those introduced in France, as recommending by the Law Commission, would substantially reduce children’s exposure to alcohol marketing and protect children from the adverse effects of early onset alcohol consumption. However, persistent alcohol industry lobbying has successfully weakened important aspects of the French Évin Law, such as permitting televised and outdoor alcohol marketing, highlighting the need for continuous advocacy and public support even when robust legislation is introduced. Featured image credit: People cheering at a party by Yutacar. Public domain via Unsplash. Tim Chambers is a Post-Doctoral Research Fellow at Imperial College London. He has written on alcohol marketing policy and child health. Louise Signal is a Director of the Health Promotion and Policy Research Unit at the University of Otago, Wellington. Her research focuses on identifying and addressing environmental determinants of health and has a strong focus on addressing inequities. Her work includes obesity prevention, addressing harm from alcohol and gambling and tackling inequities in cancer treatment. Louise is principal investigator on the Kids’Cam study, research that used automated cameras to study the world in which children live.